The Pittsburgh Pirates are a professional Major League Baseball team based in Pittsburgh, Pennsylvania. They play in the Central Division of the National League. They have won five World Series championships. The Pirates are also often called the Bucs or the Buccos. This is because the word "buccaneer" is slang for pirate. The Pirates had success in the early 1990s. However, more recently, the Pirates have not had success. In fact, the Pirates have not had a winning season in twenty years. The Pirates play their home games at PNC Park in Pittsburgh. PNC Park is next to the Allegheny River, and downtown Pittsburgh can be seen from the stadium. 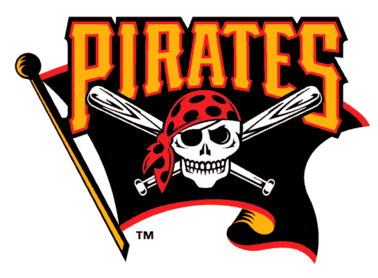 The Pittsburgh Pirates were formed in 1882. They first played their games across the river from downtown Pittsburgh, in an area that was then a separate city called Allegheny. The team was also called Allegheny, or "the Alleghenys". Around 1890, the city of Pittsburgh annexed Allegheny. The team was then renamed "Pittsburgh", with no nickname yet. In 1891, the Pittsburgh team signed a contract with a player who had belonged to a team in another league. They were accused of "pirating" the player's contract. Soon after, the fans started calling the team "the Pirates". Later the team adopted the name as their official team name, the Pittsburgh Pirates. The Pirates have won five World Series. They won their first in 1909, beating the Detroit Tigers. The Pirates also won World Series titles in 1925, 1960, 1971, and 1979. Some famous players for the Pirates have been Honus Wagner, Ralph Kiner, Roberto Clemente and Willie Stargell. Pittsburgh Pirates Facts for Kids. Kiddle Encyclopedia.